A month ago we presented BigMLer, an open-source command line tool that enables the creation of BigML datasets, models and predictions in the Cloud in the twinkling of an eye. We have been working hard on improvements to this tool, putting more capabilities on your command line to manage the Machine Learning Cloud. Recently, a new member has arrived to our BigML family: evaluations, and everything is being adapted to welcome the newcomer. That’s why we now present an evolved version of BigMLer that extends and improves our existing features. It makes managing your ML resources easier than flying a kite, a child’s game! 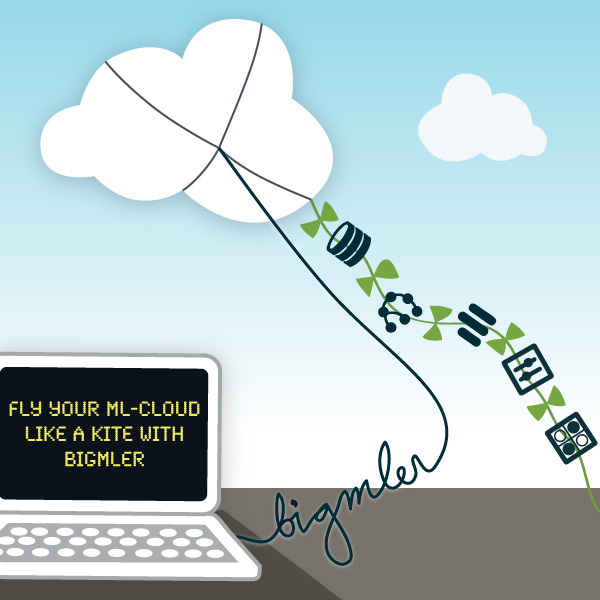 BigMLer sits on the shoulders of BigML’s API Python bindings to keep you connected to your cloud resources. A new version of the bindings has just been released which includes a REST API interface for evaluations similar to the ones already available for other resources. Evaluations will tell you how your model performs, showing its accuracy, precision, recall, F-measure and Phi coefficient. To create a new evaluation two main ingredients are needed: a model to be evaluated and a dataset to feed the model and evaluate it, but the only thing you need to start working is a bunch of data that seems to be related to some property you would like to predict. creates an evaluation of the model using the 20% that was originally left out and saves the results in a printable text format and also in json. What do you think of it? Easy, huh? That command generates a BigML source, and dataset from data/test_iris.csv. Then performs an evaluation of the given model using the generated dataset. At this moment you may be thinking: but where can I find these identifiers? and where are evaluations stored? As we mentioned in the first post, each new BigMLer call stores its results files in a separate folder. You can choose the folder, but if you don’t a new one is created named using the datetime information (e.g. TueJan2213_182243). There you will find the predictions or evaluations results. And what about the rest of objects it creates on the way? They can also be found there, but here BigMLer has evolved too. BigMLer will show you the steps it goes through to fulfill your request. No more holding your breath between every blink of the cursor. You will see what’s happening instantly and can inspect live each newly created remote resource using its link. [2013-01-22 18:22:48] Model created: https://bigml.com/dashboard/model/50fecae737203f19ca0032f4. [2013-01-22 18:22:48] Creating local predictions. As you can see, there’s also a summary of the generated files at the end. In the example, the newly created TueJan2213_182243 folder contains a file for each created resource, another for the local predictions and a bigmler_sessions file that stores the same info shown in console. Of course, you can set --verbosity to 0 and keep it as silent and peaceful as it was. Or maybe your data evolves and say you build an ensemble per week and want to predict using the models of the last three weeks. You could create the last week ensemble with the new data and combine votes with the two previously existing ones to reach your goal. and the information stored in each models’ prediction local file is used with the new voting algorithm. No latency, no remote connection, everything you need is stored in you computer and ready to use. As you certainly know, reality can be a drag and many things (network failures to name one) can disturb BigMLer’s connection to the ML-Cloud. When our kite’s rope breaks, BigMLer’s process stops and this can be rather disappointing, specially when you are about to end the 999th model of your 1000 models’ ensemble. To help you in such cases, the --resume flag comes to your rescue. [2013-01-22 20:06:49] Dataset not found. Resuming. [2013-01-22 20:06:50] Model created: https://bigml.com/dashboard/model/50fee34937203f19ca003321. So many flags, so little time, what can I do? With great power comes… great numbers of flags! and maybe their standard default values are not the ones you use frequently, so you have to write your own defaults again and again… No more of that! BigMLer will use your own defaults. where the flags values to be used are placed, one per line, under a a [BigMLer] section. As you see, the flag name dashes are translated to underscores. Each working directory can have its own bigmler.ini file. Thus, you could have a ~/dev folder to work with development resources using the example user defaults and another ~/release folder with no bigmler.ini file to generate the final complete resources. Just by changing directories you would generate the resources in the correct environment and should bother no more about adding the required flags. This is a simple glimpse of what you could do, but consider the gain if you have to build models with a 0.7 sample rate, statistical pruning, logging all the predictions… You’ll probably make good use of bigmler.ini. We’ve seen that our BigMLer scope has included evaluations, while also being more transparent, safe, and improved overall. Want anything else? Let us know and stay tuned!